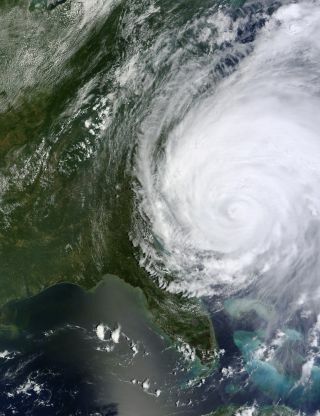 NASA, like much of the U.S. East Coast, is battening down the hatches against the arrival of Hurricane Irene. NASA centers and facilities from New York City to Florida took measures to prepare for the storm's onslaught this weekend. Hurricane Irene is a Category 2 storm currently, and it's expected to batter the East Coast with rain and a storm surge that could cause flooding in many low-lying areas. NASA has several potentially vulnerable space centers in the region, and employees at each of them are making their own preparations to weather Irene. The first NASA facility forced to deal with Irene was the Kennedy Space Center (KSC) in Cape Canaveral, Fla., which took steps earlier this week to safeguard two lunar probes and a $2.5 billion Mars rover against any storm threats posed by the hurricane. The moon probes, NASA's twin Grail spacecraft, are attached to their rocket for a planned Sept. 8 launch. Today, KSC officials stood down from hurricane alert status as Irene passed Florida on its way up to North Carolina. Since Irene stayed well out to sea as it passed KSC, the storm had little impact on the space center. "With Hurricane Irene well past Florida's central coast, Kennedy has been given the 'all clear,'" KSC officials wrote in a Twitter status update. "There are no reports of injuries or damage." Near Virginia's coast, workers at NASA's Langley Research Center draped plastic tarps over computers and even elevated trash cans to avoid damage from potential flooding. Langley officials posted photos on Twitter of sand bags along buildings and other efforts to protect the center against damage. NASA's Langley Research Center in Hampton, VA, prepared for Hurricane Irene on August 26, 2011: "Other sandbags are already lined up trying to guard against the #hurricane." "Great team working hard to protect NASA Langley and crucial research," Langley officials wrote in a Twitter post. NASA's Wallops Flight Facility on Wallops Island, Va., shut down at 12 p.m. EDT (1600 GMT) today to give workers time to make their own preparations for Irene's arrival. The center is expecting severe flooding from the storm surge generated by Irene. NASA's Langley Research Center in Hampton, VA, has sandbags prepared for Hurricane Irene on August 26, 2011. "Our Wallops facility is much more in harm's way because it's right on the eastern shore," said Ed Campion, a spokesman for NASA's Goddard Space Flight Center in Greenbelt, Md., which oversees the Wallops launch site as well as the Hubble Space Telescope program and other space missions. "There was an estimate today of possibly 2 feet [0.6 meters] of standing water washing over the island from the storm surge." Wallops is a launch site for research rockets and balloons, as well as some orbital satellites. It will also host launches of the private Cygnus robotic cargo ship being built by the company Orbital Sciences Corp.
Campion said a small "ride-out crew" of Wallops personnel and security guards will stay at the facility throughout the weekend. A similar crew will monitor the Goddard Space Flight Center in Maryland to make sure buildings and equipment there are protected against flooding or leaks. At NASA Headquarters, Mirelson said the space agency's preparations for Hurricane Irene are similar to the measures they would take ahead of a major blizzard in the winter. If Irene causes serious issues at the NASA Headquarters building, some daily responsibilities (such as daily NASA TV programming) can be shifted to the Johnson Space Center in Houston or other centers. The space agency will adhere to guidelines for government employees set forth by the Office of Personnel Management, which has cautioned employees to be sure that personal and family action plans are in place, Mirelson said. NASA's Langley Research Center tweeted about their preparations for Hurricane Irene on August 26, 2011: "Employees have started covering equipment in anticipation of #Hurricane." And NASA Headquarters has an active telecommuting program. "Most of our people have laptops and iPads and Blackberrys, so as long as there's power or an ability to recharge, we should be in good shape," Mirelson said. Meanwhile, several NASA East Coast facilities traded messages to each other via Twitter today, offering words of encouragement ahead of Irene's arrival, most of them between the Langley (@NASA_Langley) and Wallops (@NASA_Wallops) facilities. "@NASA_Langley – wishing you all the best as we weather this together!!" Wallops officials wrote.